ArtyFartyAnnie: CSI #245 - Freestyling!! It's the first day of a bright new year - time to look forward to everything 2018 has in store. 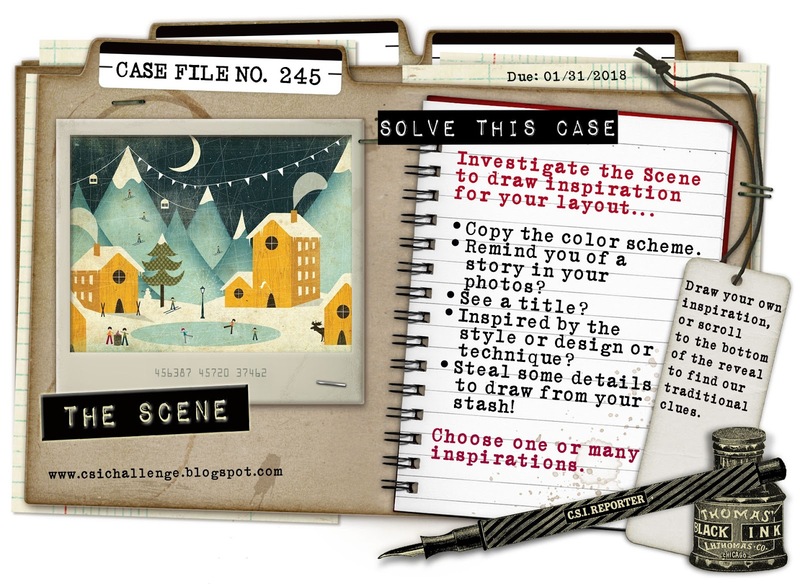 It's also time to check out the first Case File of the year over at CSI: Color, Stories, Inspiration - I'm especially excited about this one because I am rejoining the team of CSI Detectives and this is the first case I've cracked as a Detective for quite a while. New for 2018 - Freestyle!! 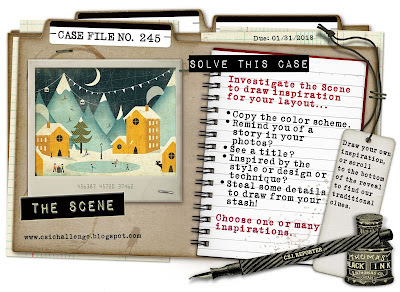 You can use whichever clues take your fancy; as many or as few as you like from Scheme, Evidence and Testimony - or simply draw your own inspiration from the Scene. The picture shows Yours Truly having Big Hugs with my little Great-Niece Leila during a visit to Cornwall. The photo isn't great quality due to the lighting, but it's precious to me all the same, especially as I don't get to see my family in Cornwall very often. I was inspired by the Scene to create the feeling of a landscape on my page, and I really had fun with it, using torn patterned papers, hand-cut and die-cut elements and the little wooden trees which I coloured with Distress Ink. The papers are mostly old scraps from my stash, except for the one with the circles, which is from the Kaisercraft Daydreamer collection. Why not have a go at cracking this case yourself? You have until 31st January and there are loads of fab prizes to be won - check out the CSI blog or FB page for more clues and lots of inspiration. Congrats again for re-joining the superb CSI team. It was my first gig and I loved every minute of it. Your rural scene is perfect for the sweet photo and I especially love the little cluster at the bottom right. Happy New Year Annie - may all your dreams come true. What a fun photo and a fun layout to compliment it! So happy and cheerful! Here's for a happy and cheerful 2018, Annie!